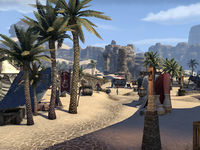 The Baandari Caravan is a marketplace located in northwestern Kozanset. Baan Dar's Brew — A stall run by the brewer Wet-Whiskers. Caravan Commissary — A stall run by the chef Soreheels. Hashuri's Pouches & Pockets — A stall owned by the pack merchant Hashuri-daro. Khaj-Walker's Market — A general goods stall owned by Mazalish. Khunzum's Curiosities — A stall owned by the mystic Khunzum. Spider-Bite Swords — A weapons stall run by Eats-Spiders. Taut-String Traders — A stall owned by the woodworker Mulama.